Dr. Ari Sherris, assistant professor in the department of teacher and bilingual education at Texas A&M University-Kingsville, spent a year living among the Safaliba in Mandari, Ghana, a remote rural village in western Africa as part of his Fulbright Grant. More recently, Sherris shared the lessons he learned in Ghana in a presentation to the United Nations Study Group on Languages and Sustainability. Sherris’ presentation was entitled Lessons Learned from Ghanaian Safaliba Literacy Activists: Theorizing Expanded Literacy Opportunities in Unrecognized Mother-Tongues. 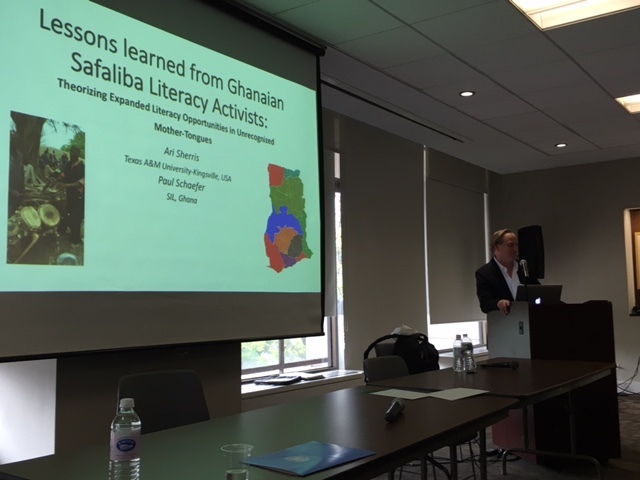 “We discuss a yearlong project led by Ghanaian activists to situate literacy in Safaliba, an unrecognized small indigenous language,” Sherris said. “We then outlined a model of language management for the 60-plus additional languages in Ghana that populate rural communities where government policy currently insists on one of the 11 hegemonic regional languages as mother-tongue early literacy, much to the detriment of literacy development and learning for most children in these areas,” he added. “The model requires a considerable amount of decentralized decision-making not unlike complementary educational programs in Ghana and elsewhere, although not without setting some ground rules for the appointment of local leaders who believe in the concept of going local, going small, blending it with the national language and bringing in the regional hegemonic one only later, either as an elective or additional language,” Sherris told the group. Sherris was in Ghana from August 2015 to July 2016. Safaliba is the name of the language and its people. It is a small Ghanaian language spoken by 7,000 to 9,000 people. He was assisted by Paul Schaefer who was raised in Ghana and is a field linguist with the Summer Institute of Linguistics who has lived among the Safaliba for over a decade. “His research documents and analyzes an expanding body of phonological, morphological, semantic and pragmatic aspects of Safaliba,” Sherris said.